Adapted from an NIH publication. Notice: Health and fitness articles on this site are for information only and do not constitute medical advice. Always consult your health care provider for health advice and treatment or before starting exercise or nutritional programs. • Increase the number of calories your body uses. • Has your health care provider ever told you that you have heart trouble? • When you are physically active, do you have pains in your chest or on your left side (neck, shoulder, or arm)? • Do you often feel faint or have dizzy spells? • Do you feel extremely breathless after you have been physically active? • Has your health care provider told you that you have high blood pressure? • Has your health care provider told you that you have bone or joint problems, like arthritis, that could get worse if you are physically active? • Are you over 50 years old and not used to a lot of physical activity? • Do you have a health problem or physical reason not mentioned here that might keep you from starting a walking program? • Choose a safe place to walk. Find a partner or group of people to walk with you. Your walking partner(s) should be able to walk with you on the same schedule and at the same speed. • Wear shoes with thick flexible soles that will cushion your feet and absorb shock. • Wear clothes that will keep you dry and comfortable. Look for synthetic fabrics that absorb sweat and remove it from your skin. • For extra warmth in winter, wear a knit cap. To stay cool in summer, wear a baseball cap or visor. • Do light stretching before and after you walk. • Think of your walk in three parts. Walk slowly for 5 minutes. Increase your speed for the next 5 minutes. Finally, to cool down, walk slowly again for 5 minutes. • Try to walk at least three times per week. Add 2 to 3 minutes per week to the fast walk.> If you walk less than three times per week, increase the fast walk more slowly. • To avoid stiff or sore muscles or joints, start gradually. 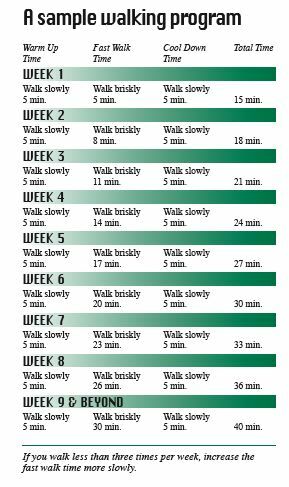 Over several weeks, begin walking faster, going further, and walking for longer periods of time. • The more you walk, the better you will feel. You also will use more calories. 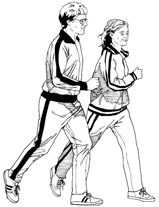 A sample walking program and examples of easy stretches are shown below. • Walk in the daytime or at night in well-lighted areas. • Walk in a group at all times. • Notify your local police station of your group’s walking time and route. • Do not wear headphones. 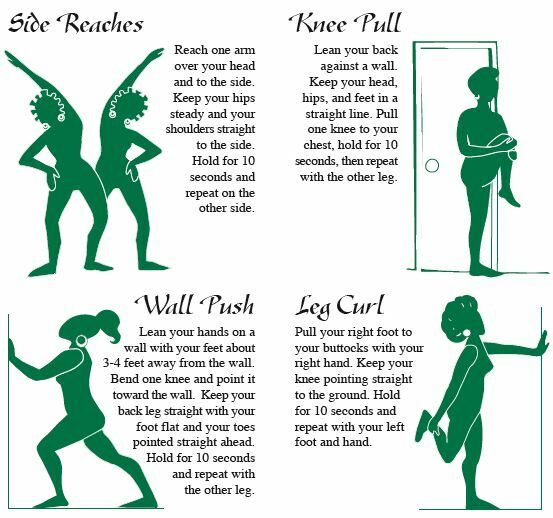 Before you start to walk, do the stretches shown here. Remember not to bounce when you stretch. Perform slow movements and stretch only as far as you feel comfortable. • Walk with your chin up and your shoulders held slightly back. • Walk so that the heel of your foot touches the ground first. Roll your weight forward. • Walk with your toes pointed forward. • Swing your arms as you walk.